Invidia cat-back exhaust system for the R56 Mini Cooper S 2007 and newer, and R58 MINI Cooper S Coupe is one of the highest quality and best sounding exhausts on the market for the R56. 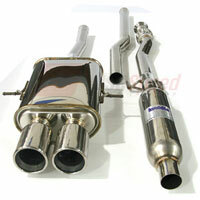 It features dual rolled tips and 2.5" piping to guarantee free exhaust flow through your turboed Mini. It's designed to bolt up to the stock downpipe and eliminates the second cat. All necessary hardware and gaskets are included. No cutting required for install. fantastic sound all around. didn't replace crossmember because I couldn't figure out how to not have it bang into the exhaust pipe. added washers to rear mount so tips don't fry the bumper.